The consumer world is all about straight lines - the fastest way between two points - the most convenient route - stuff like that. But the path to sustainability is more akin to a spiral - it's about cycles and interwoven process. 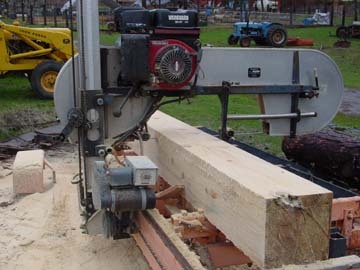 The work we're doing this week with the saw mill is a good example of what I'm talking about. It's time to replace the plastic over the workspace between the two shipping containers located on the landing. The original plastic was eventually was killed by the UV rays in the sunlight; it was rated for three years use, but actually lasted five, so that was pretty good. Part of the spiral concept comes into play here since rather than just replace the plastic, we wanted to wait and take that space to the next level of effectiveness. 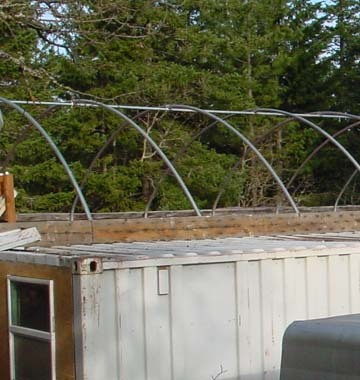 While the plastic dome kept the rain and snow off that 20'x40' space, which made for a great place in the winter to work on vehicles like the tractor or the backhoe, still there was a problem in that all the rain and show melt that ran off the plastic proceeded to run down the side of the container and flood the interior of the work space. What we needed was some way to channel the rain away from the inner court yard, into a gutter and from there into a rain water holding tank. 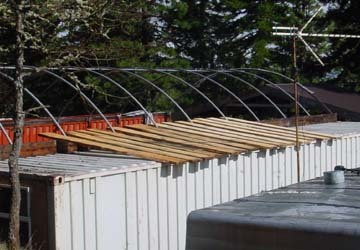 In order to make that happen, we needed to install a faux roof over the container, something with enough slope to move the water off the roof and into the gutter. For that to happen, the faux roof needed to have some slope, and to make that happen we created a forty foot long gluelam out of 2x10s. When making a gluelam you stagger the joints so that once the glue dries, the unit works like a single, really long, beam. Okay, now we've got the lift - next come the joists. We decided to go with 2x10 joists, not because they needed to be that heavy, but because we wanted the extra two inches of slope. By cutting down one end of the 2x10, we're able to get a drop of one foot in eight feet. Given how slick metal roofs are, that should move the water quite effectively. The next step involved bringing in some recently cut logs to the saw mill to cut into the twenty-one nine-foot-long 2x10's well need for each container's faux roof. In the sixteen years we've been here, we've never cut down a living tree except those that were in the way of a building we were putting up. It takes about eighty years to grow a tree to full size here, so the last thing we would want to do is cut down something that can't be replaced, at least not in our lifetime. Actually, we don't have to kill trees in that there's a regular competition going on in our woods as the firs, pines and oaks struggle against each other for dominance. In the wet years, the firs prosper, while in the dry years the pines surge ahead. And in the really dry years, it's the oaks that hold the ground. Each winter, some trees are killed as snow and freezing rain rip the tops out of them. Some years the beetles do too much damage and the weaker trees succumb. It's always something, and those are the trees that we endeavor to incorporate into our construction projects. This time we started off with some logs that were cut down by the road crew last spring. Windward has a half mile of frontage on the county road, and last year the county decided to come through and improve it by straightening it out. They own a 30' right of way on each side of the center line, and if they feel they need to take out a tree to improve visibility, the out it comes. While they have the right to cut down trees as needed, the trees they cut still belong to us. Before fall got too far underway last year, I took the backhoe out and brought the sawable logs back to the landing just to make sure that someone didn't pull up and decide that they'd make good firewood. People aren't supposed to take wood that's cut down like that, but if you leave it out there long enough, someone's likely to help themselves rather than "see it just rot and go to waste." While the goal of this cutting is a stack of 2x10s, there's more involved than just cuttings four slabs off to create a cant, and then slicing off the rafters. It's a case where haste makes waste, and this wood was too nice to waste. If you go to Home Depot and buy what's called a "nominal 2x10", what you'll actually get is a board that's about 1 and 5/8" thick by 9 and 5/8" wide. The reason for the discrepancy is that 2x10 refers to the rough cut that was originally made from the green tree at the mill. In order to speed up the cutting process, they want the wood to be as wet - also said to be "green" - as they can get it. One way they accomplish that is by floating the logs in the mill pond for a few days before they're snagged and drawn into the millsaw. That wet wood then has to be carefully stacked and stickered so that it can go through the drying sheds without warping. After that, the rough cut plank is sent through the planing shed and brought down to the finished dimensions. That way each finished plank is the same dimension, and slight variations that express themselves during drying are milled away. The saw we use is an overgrown bandsaw. We're able to slow cut the wood, at least as compared to how fast the millsaws run, with the result that we can cut drier wood than the mills like to work with. Less water means less warping, and the saw gives a smoother, more finished cut than the huge circular saws leave. So while our saw is much slower than the monsters used by the mills, it has the advantage of being able to yield more lumber from a given log, and for that lumber to be ready to use for most construction purposes. 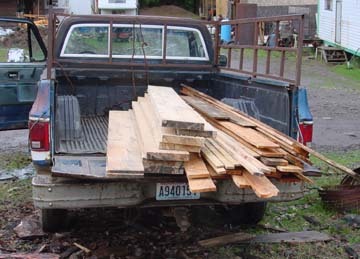 In between the first cut, and the point where the cant is cut down to the final dimension, there's a lot of opportunity to salvage wood that can be use for other purposes. For example, there's a board that needs to be nailed to the ends of the dining hall's rafters. When we were putting the metal on the roof, we only had enough 1x8s cut to go a third of the way. 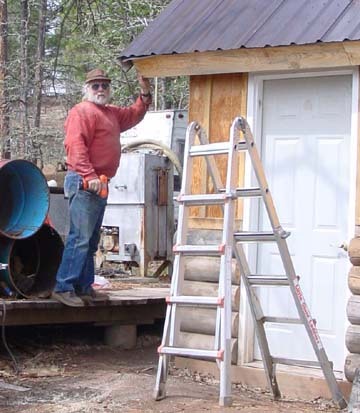 And so, as I cut the log down on the way to the cant, I looked for opportunities to also cut some 1x8s for the dining hall, and some 1x5s for the trim needed to finish up the solar woodshed. This is where the spiral approach comes in. We could have gone out and bought commercial 1x8 boards and finished that part of the dining hall, but that would have cost money which could be better spent elsewhere, and it wouldn't have matched the general aesthetic we're working to incorporate into our buildings. 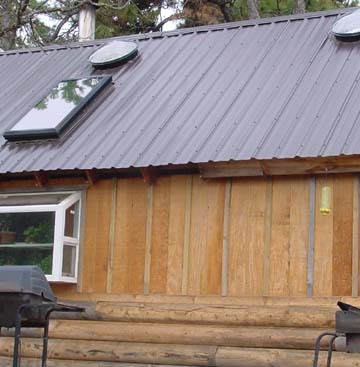 Anyone can build using store bought lumber; not everyone can build with trees grown on the land that the building serves. Eventually, the cuts are done and it's time to "do the dishes." The slabs that have too much of the outer part of the trunk on them to be useful get stacked back on the saw on edge and are gang cut into two inch strips. These strips will in turn be cut to 16" lengths and sold as kindling. By doing this extra step, and adding in a little marketing, I'm able to bring in enough income to cover the cost of operating and maintaining the saw. And that's not all. There's now a substantial amount of saw dust to gather up and send off to vermadise to feed the earthworms. And there's a goodly pile of bark to run through the chipper to create mulch to put around the base of the fruit trees, or the tannin can be leached out from ground up bark and used to tan leather. The more you know the more you're able to treat the by-product of one process as the input for another. Because we're doing this as a "human scale" enterprise, we don't generate "waste" from the process. Each component of the tree becomes a resource for some part of our program. As a good rule of thumb, the more effective you are at finding productive uses for all of the outputs of any process, the more sustainable that process is. And while all that's to the good, there's also the profound sense of satisfaction that comes from being able to transform a log - a log that would have otherwise just become fire wood - into lumber that will help take Windward on to the next level, and do it without having to divert capital away from the things that we can't produce for ourselves. In the end, there's no sustainability without creativity. This is just one example of the ways we're learning to create value using materials that our land naturally produces. As stewards, we strive to use what is here effectively, and to insure that those things which are use are renewed, so that those who come after us will also have the materials they need readily at hand. Those are great words, and easily supported. What's not as easy is the task of gathering the necessary tools and learning the necessary skills in order to make it actually happen. I hope you've enjoyed this run through of one of the ways that Windward transforms the concept into tangible progress.